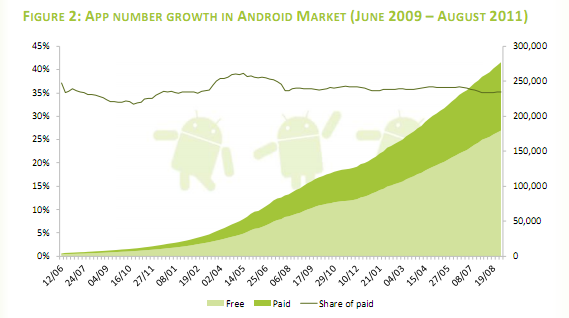 The Android Market continues to explode. Recent statistics published by research firm Ovum predict that app downloads in Android’s marketplace could reach 8.1 billion this year, compared to 6 billion for iOS, with total growth in app downloads expected to be as much as 144 percent this year. 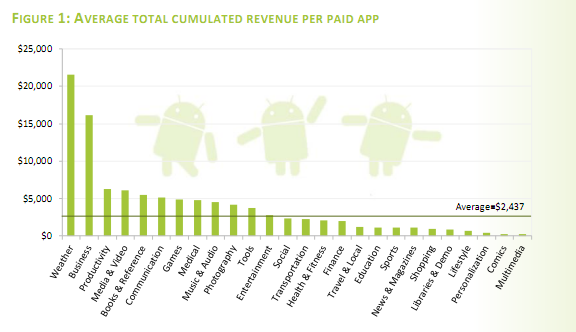 Today, mobile research firm Research2Guidance is releasing a report that gives a detailed look into the Android marketplace’s current escalating growth, what’s trending, and what categories of apps are making the most money. Traditionally, free, ad-supported apps have gobbled up most of the share in the Android Market. But what about those paid apps, how much are they making, and are they worth it? The research firm found that, in August, cumulative revenue from each category varied from $300 to $21,000, with the average Android app having generated $2,500 since publishing. While this isn’t a mind-boggling average, it’s not so bad either. What’s more the research firm said that, just by “choosing the less competitive and more price intensive category, developers can increase their potential revenue by 900 percent”. In terms of categories, unsurprisingly, nearly a quarter of all apps downloaded on the Android Market are games, as this has long been the largest and fastest growing category on the app store, preferred by developers across the board. However, it seems the intense competition in the gaming space has led to diminishing revenue as monetization potential slipped over the last few months. On the other hand, what may be a bit more surprising is the most lucrative category of apps in the market: On average, weather apps have generated the highest total revenue from paid downloads. Part of the reason for this is that the selection is limited, and it’s really a must-have app for every smartphone user — we want to know whether we’re about to walk into a tornado or not. Of course, the use case is very specific, and most are loathe to use (or develop) yet another weather app. There are only so many possibilities. The research firm, instead, advised developers to consider innovating on business tools — users are not as opposed to paying a price for a good business app that helps improve efficiency, for example, and the space, the firm said, is far less crowded than the rest. But how about the app store’s growth? According to the report, the Android Market remains ahead of Apple’s App Store in terms of additions of content. During August, the store grew by more than 20,000 apps, during which time Apple added another 15K apps to its iPhone App Store. As of the beginning of this month, the total number of apps in Android Market was 277,252, and the share of paid apps remains at 35 percent, with the average selling price of those paid apps being $3.13. Android Market is nearing 6 billion total downloads, which should be reached by the middle of September, the report said, and every week nearly 1,500 new publishers join the store. For more, check out Research2Guidance’s free August report here.